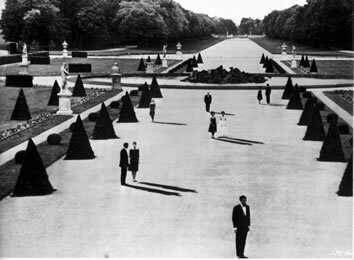 The Film Emporium: Is 'Last Year in Marienbad' Incomprehensible? I had the same reaction as you, I can't say I disliked the film. I found it to be very unique and unforgettable, but I still can't make any sense of any of it. One of the most puzzling films I've ever seen. If you liked this I would also recommend Hiroshima, Mon Amour, by the same director. It's a much better film. @ Jack - It is very intriguing, and I have this compulsion to make sense of it. I have heard of the other one you mention, i might check it out. Thanks! @ Anonymous - I haven't been following Cannes too much, although I am seeing Tree of Life and Sleeping Beauty when they come to Sydney next month. I have heard mixed reviews about Sleeping Beauty. There was a silent film playing at Cannes? Sounds very interesting. Thanks for the recommendation, i'll keep an eye out for it! @ Anonymous - I just saw a wonderful trailer for The Artist on another blog. It looks amazing. All of a sudden, I can't wait to see it haha. It's playing out of competition (along with Pirates 4 and The Beaver etc.) so it will likely have a pretty wide release later in the year.